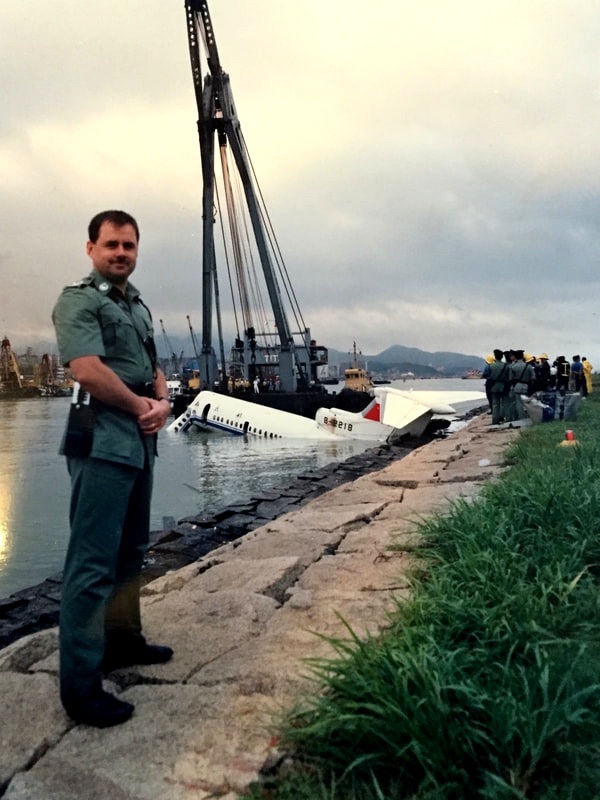 Trident Crash Kai Tak 31 August 1988. People get promoted for all sorts of reasons. Sometimes it's due to ability. Plus getting promoted can be a tricky business. On hearing rumours of promotion, one chap thought it would be a swell idea to get drunk. Fair enough. Then he decided to share his opinions on the ‘biased’ promotion system with a deputy commissioner. A ten-minute tirade went down like a fart in a spacesuit. Having not received his confirming letter, he found himself in the sin-bin for a year. The unwritten rule - never believe it until you’ve seen the Commissioner, got the letter in hand and arrived in your new post. Even then, it’s wise to check with the Room Boy that your office is not temporary. For one promotion exercise, my boss gave me details of my new posting and date of the move. I contacted my future station to find it's not happening. And it didn’t. The problem is the rumour mill goes into overdrive as officers anxiously await news. People cling to the slightest ‘piece of wind’ and then start soaring on the updraft before their wings arrive. It’s a sure way to crash and burn. It’s a lesson I had to relearn a couple of times. You have to feel sorry for the guy who proposed to his girlfriend thinking he'd made it. The extra cash to set up a home and the status told him it's time to act. O dear. He's passed over. Then the ‘romance’ fell apart. All for the best I suppose as he made it the following year sans wife. Anyway, I’m in Kowloon HQ, feet under the desk. Planes pass my window on approach to Kai Tak, which is a constant distraction. My role is diverse as I look after contingency planning and various projects as Chief Inspector Kowloon East. That's the dull admin side of the job. Also within my portfolio is the Missing Person Unit and a Regional Special Duties Squad. It’s an eclectic mix. One minute I’m deep in an administration file dealing with equipment allocation, the next helping to kick-in doors. If you couldn't guess it, I preferred the latter. The redoubtable Liz Wah commanded the Missing Person Unit. She knows her stuff, is competent and trusted to get on with it. On occasions, she drags me to visit the darkest parts of Kowloon East in search of missing kids. Grotty back-street amusement centres, with low-lighting and tattooed triads, are our focus. The staff know to cooperate. Any trouble and we will be back again, and again, and again. Plus any cheek will evoke the wrath of Liz. Watching grown men cower under her verbal onslaught is something to behold. I’m frightened, and she works for me. As we enter the premises, her team has a routine: cover the back doors to block escape routes, switch on the lights - line the kids up for an identity check. We’d usually encounter a few missing teenagers or find others who’d fled from care homes. Later we’d be seeking ‘care and protection orders’ to remove these kids from temptation. It’s not unusual to hear that their parents have given up on them. The story is always the same. It’s a tale I heard repeated throughout my career. Abandonment, some abuse and then the next generation carries it forward. Dad is gone, Mum is struggling to hold down two jobs, while the kids are running wild. Some girls drift into vice work. The trajectory of their careers is rote. The Social Welfare Department and various NGOs did their best for this lost children. They had their successes and failures. On the other side, the triads always stood ready to provide an identity, home and companionship for a wayward kid. The lure of easy money, coupled to a good time was inducement enough. Breaking that cycle is no easy task. Operation Breakthrough was yet to emerge, and the Social Welfare Department homes proved a stop-gap at best. In an attempt to steer them Liz played the strict mother. She made it clear to them what awaited in the future unless they controlled themselves. I sometimes wonder how many of those kids we hauled away to care homes made it. Whereas senior officials talk of numbers of missing girls and boys in trouble, police officers witness the relentless grind of people falling into turmoil. Each story is a wrench. At times it’s genuinely confusing and always emotional. You begin to understand that the veneer of normality and order is wafer thin. I forgive my daughters for thinking I was over-reacting as I warned them of life’s dangers. That’s the cross that children of cops have to bear. The work of the missing person unit often entails scratching around the underbelly of society with people’s very existence fragmenting. Anti-drug work operates in the same realm. The Regional Special Duties squad focused on drug trafficking cases. It supplemented the district teams with a supposed focus on drugs moving across the region. The team operated independently of other units to avoid compromising our operations. With access to surveillance teams, it could take time to develop a target of interest. Given the vast amounts of money involved, the work of the unit proved high-stakes. The officers needed to apply counter-surveillance tactics to avoid tailing or ‘turned yellow’. They'd come on duty at remote sites and adopt other methods. The squad members usually served for a short tenure. The long stressful hours took their toll as officers burnt out after six months. Plus, having to work with informants and undercover meant they had a limited useful life. Even before the advent of mobile phones with cameras, the opposition was keen to get pictures of the team. As an Expat I’d stand out like a sore thumb, especially as I drove in and out the headquarters each day. Thus, typically, I could only get involved in their work during the final stages. An ambush or raid was my opportunity to see the unit and show support. Let’s be honest; it’s also the fun part. On one occasion, I deployed as a guest house resident for a day. Having booked in, I acquired a door key. Meanwhile, the squad tracked an expatriate trafficker as he moved his drugs about. We waited. Once in his room, I let the raiding party into the hostel. Koss, the drug dog, disagreed. He took less than 20 seconds to find a haul of heroin hidden inside a hollowed out bedroom door. That operation went smooth. It wasn't always the case. Vehicle ambushes are a dangerous option. You never know what the culprit might do. A car is a lethal weapon when driven to smash through roadblocks and evade capture. Careful planning, allied to fast initiation, is the key. Overwhelm the suspect before they can react. We had a tip that needed developing. Weeks of work identified a car as delivering heroin to Sau Ma Ping Estate. Daily the dispatch would arrive at around 6 am to supply the local traffickers. They'd move it on to the local addicts. We drove the route the target vehicle took to study our options. Sau Mong Road offers the opportunity of blocking the car at a set of traffic lights. We’d take control of the traffic lights to stop the target; then two tailing cars would block his rear, while a large van came in to cut off the front. Arresting officers could then leap out; that was the plan. Coordination was crucial. It didn’t work. Our target halted at the traffic light with the two blocking cars behind — no going backwards for him. Plus a build-up of traffic made reversing impossible. Go, go, go. We sprang the ambush. The blocking van came into position at an angle, as the officers jumped out. Because of the offset position of the van, the culprit now had an opportunity to nudge us out the way. And he did. Half mounting the pavement, he pushed the van aside and set off. Bugger. We had no option but to follow. At the first junction, the driver swung the car right, clipped the kerb-side and spun to face us. Our van rammed him, pushing him back onto the pavement. Hauled from the car, we discover the driver is 72-years-old. In the back of the vehicle is two kilograms of packaged drugs. Bingo. Controlling the handling of informants was a constant headache. The simple truth is informants don’t cooperate with the police out of goodwill or community spirit. They either need money or want us to take out the opposition. Always the question is who is playing who? Controlled buys and ‘setting up’ situations stretched the limits of ethical policing. An informant arranged for a drug courier to deliver drugs to a storage facility in Kowloon Bay. Tipped off on the drug run, we caught the guy redhanded. We achieved a result, pushed up our figures and attained welcome press coverage. And yet, it soon became clear the informant wanted the courier out of the way over a personal dispute. Faced with that we could either turn a blind eye and keep the informant or put him in the frame. At a tasking meeting, we opted to go after him. It took some time, but about six months later he's taken down by another unit. It's a nasty business. The ‘war on drugs’ rhetoric could spark pressure on us for results. Usually, an incident or media report fired up the bosses. A moral panic seizes the community as newspapers report ‘drug dealers near schools.’ Distorted stuff like this is not new. The media had their headline, the bosses basked in the reflected glory of the publicity, and everybody assumed the ‘war on drugs’ continues. I saw the merit of these quick interventions for PR purposes and sending a message to the drug traffickers. They needed to know we could hit them and hard. And indeed, they should be kept away from schools. Thus we put the fear into them. Even high visibility uniform patrols could do that. Nonetheless, drug policing would only be truly effective by taking out the big guys and the supply routes. That takes time, resources and consistent effort. Fire-fighting in response to media pressure with short-term operations burnished our image. It didn’t help long-term. In essence, drug enforcement activity breaks down into surveillance, use of intelligence, controlled-buy operations, high-visibility patrols and crackdowns. The latter produced the headlines and had the least long-term impact. Crackdowns usually involved sweeps through a target area; it's the 'round up the usual suspects' approach. It’s a fact of policing life that those juicy headlines - ‘Massive Haul of Drugs seized by Police’ - went down well. They polished our reputation. A few officers I knew could harness the media to significant effect. The so-called ‘Chicken Killer Superintendent’ played his hand well. He earned the nickname as he cracked down on vice activities. For the uninitiated prostitutes are nick-named ‘chickens’ in Cantonese. He mounted a sustained campaign in the 1990s against syndicated vice in Tsim Sha Tsui. He brought the media into his orbit. Not everyone, especially those above him, welcomed the publicity he gained. Professional jealousy and suggestions of grandstanding didn’t earn him friends everywhere. Nonetheless, the public loved it. As I later discovered, getting too close to the media is a two-edged sword. They’re not above embellishing or fabricating a story. More on that in a later chapter. For the majority of my two-year tenure, I'm blessed with two outstanding squad leaders. Both understood the risks of the role. Each had time under their belts. They knew a compromised officer when they saw one or that overstepping the mark demanded immediate action. These days the drug scene has changed. Street-level trafficking is less common. The modern business model uses WhatsApp and direct sales. Buyers will contact the trafficker, arrange a delivery, with runners doing the donkey work. Online payments ease the transactions. Thus the illicit trade is out of public view, which has in some instances dampened demands for action. Of course, the visible trafficking by asylum seekers in Lan Kwai Fong remains evident to anyone who is looking. The Hong Kong public's attitude towards drug taking remains conservative. Visitors are often shaken by the stringent local laws on cannabis use. Buying/selling or smoking weed carries a maximum sentence of seven years in jail and a fine of HK$1,000,000. While prison sentences for smoking are rare, large fines in the tens of thousands are not unheard of. The 31st August 1988 started as a quiet day. It's wet and thundery outside, typical for the time of year. I'm head-down wrestling with various personal reports and appraisals. It is a tedious but essential job. My reports have a bearing on peoples careers; thus its essential I reflect in exact terms their strengths and weaknesses. Outside my office, I hear shouts and people running. Somebody bursts into my office. "A plane's crashed at the airport." It's at times like these that you need to slow down a little and assess. On arrival in the post, I vaguely remember it mentioned that I had a role in the event of an aircraft crash. I immediately went to the control room, where pandemonium has broken out. Phones are ringing, orders barked and briefings given. I grab my assigned 'action card' which details my role. I'm to man the Mobile Command Unit (MCU) vehicle that will form part of the inner cordon. First, I jump in a car and head to the Police Driving School next to Kai Tak, to collect the MCU. I'm thinking "Is it going to be there, is a driver available?" I needn't have worried. As we drove into the compound, the MCU is sitting there - engine fired up, the team aboard awaiting my arrival. Off we go blue lights and sirens. We join a convoy of ambulances and fire-engines all heading through the airport security gate and out to the crash site. The elderly Hawker Siddeley Trident is sitting about halfway down the runway. It's tail resting on the seawall with the semi-submerged nose broken off facing Kwun Tong. The rain has stopped. Passengers stand huddled on the taxiway soaked in oil and the foul contents of the Kai Tak nullah. Buses are arriving to convey the walking back to the terminal. Ambulances are rushing away with the injured. In the Kai Tak nullah, boats are already arriving with the media. I set about positioning the Command Post and getting a cordon in place using PTU officers. Controlled access to the site is necessary for safety and evidential purposes. With half the plane in the nullah, I'm yelling to my Marine Police counterpart to get his sea cordon in place. The radios aren't working. He comes ashore, and we agree on a plan. All movement into and out of the crash site is now through my command post. A team of WPC orderlies document everything. The process of accounting for everybody aboard also needs to start. CAAC Flight 301 was inbound from Guangzhou with 89 souls aboard. That day Hong Kong experienced an unstable southwest monsoon. Thunderstorms and intermittent heavy rain blanketed Hong Kong with reports of wind shear. On approach, the Trident clipped the landing lights in the harbour. It then rose up in the air, stalled and slammed down onto the runway. The right-side undercarriage snapped off. The plane came to a halt on the runway seawall, with its nose semi-submerged. I faced the sobering task of checking the six bodies brought from the wreckage — all crew. Facial and head injuries suggest they've smashed into hard objects. The pilot has the distinctive mark of the instrument console edge on his forehead. Was he wearing his seatbelt? I had other questions. The Trident operates with a crew of three and has five seats in the cockpit. Yet six dead came from there. A small folding stool found in the cockpit wreckage told a story; a trainee radio operator sat unsecured throughout the flight. Some of the injured passengers admitted to not having worn their seatbelts and one stewardess. One passenger later died in hospital. An autopsy on the crew put the cause of death as drowning. Knocked unconscious the cockpit crew couldn't escape and succumbed. Royal Navy divers arrived on the scene first and unsuccessfully attempted to force entry to the submerged cockpit. A later inquiry found the shoulder straps in the cockpit crew seats unused. If they wore any seatbelt, it was only the lap belt which wouldn't prevent them jerking forward on impact. The inquiry revealed a shocking lack of safety at CAAC. No safety cards nor briefing, only two lifejackets and people smoking during landing and take-off. With the dead and injured gone, I held the site secure as a floating crane arrives to lift the plane. Meanwhile, there is congestion in the skies around Hong Kong. With a closed runway, planes divert across the region. A cleanup crew is working flat out to inspect the runway and remove any debris. At the same time, I'm shepherding a media party around. A shout goes up "Get on the taxiway." I look towards Kowloon City to see a 747 banking in on approach. Thanks for the warning! The media folks are dashing away and soon clear. In the next 15 minutes, three jets roar in. They then reverse direction to taxi back to the terminal down the runway. The noise shook my bones. Once the runway is clear, the exercise repeats. Three jets in, and taxi. This process went on for about two hours. After about six hours my job is done, I'm out of there. We rolled up the cordon, recovered our equipment and headed back to the Police Driving School. Two days later my police shoes fell apart. Whatever noxious mix was in the nullah had taken its toll. It was an exciting time to be in Operations Wing, Kowloon. For the majority of my time there the redoubtable Brian Wigley commanded the section. Here was a true leader; a man who wouldn't ask you to do something he wouldn't do. He was direct in his manner, orders and mind. We also enjoyed top cover from him. While he could bollock you rigid for some error, no one else could. Under his umbrella, we felt safe to do the job, protected from unwelcome flak. I liked him. I was fortunate to work with him in my next posting back at Police HQ.